Batteries are the lifeblood of modern boats. They are responsible for powering everything from fish finders, navigation lights, aerator pumps, stereos, and trolling motors. As the demands on boat batteries have increased, choosing the best marine batteries is crucial to getting flawless performance from your boat’s equipment. However, buying new boat batteries can be a daunting task. Different applications, chemistry, and an array of technical specs can be intimidating when starting your search. 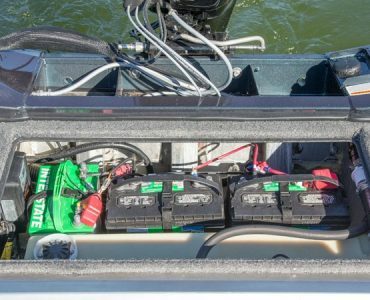 Many boaters find themselves unraveling the pros and cons of traditional lead acid vs AGM marine batteries for both cranking and trolling motors. Fortunately, it’s not too difficult to narrow down your options when armed with an understanding of how marine batteries work. 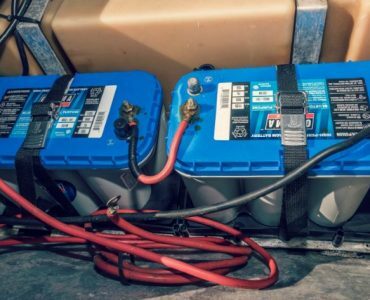 This guide breaks down the selection process into four simple sections and will give you the knowledge you need to select the best marine batteries for your needs. Your boat’s trolling motor relies on deep cycle batteries. They handle the continuous energy draw that the electric motor needs for long periods. 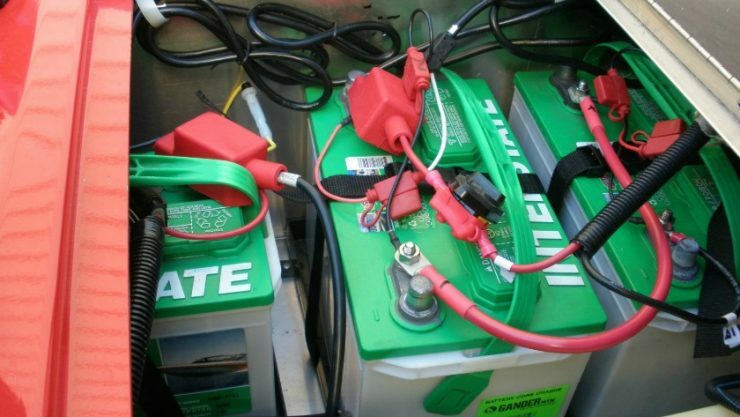 Deep cycle batteries harness a significant volume of energy that can be withdrawn when the need arises. They are like a power piggy bank that you can tap into anytime. Unlike engine-starting car batteries that dole out short bursts of high energy, deep cycle units are designed differently. They are intended to discharge energy over long periods of time and recovery completely afterwards. This class of battery enjoys this heartiness due to specific design elements. They are built with thicker plates than high-burst batteries and have greater antimony content. Deep cycle, lead acid batteries are designed to discharge regularly, generally using 45-75 percent of their capacity. Trolling motors rank as the most common use. 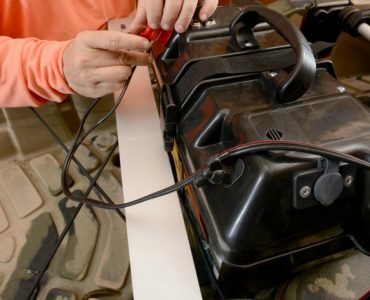 When purchasing deep cycle trolling motor batteries, a good rule to follow is to select one that can house 2-4 times the amount of energy you expect to utilize before the unit must recharge. Sometimes called “cranking batteries” because they turn over your boat’s engine, starting batteries deliver a high-energy burst of 75-400 amps that last only about 5-15 seconds. Starting batteries are easily depleted and rely on an engine’s alternator to restore the charge. These lead acid units house negatively and positively charged plates that are separated by insulation. One of the key differences between a starting battery and a deep cycle product is the thickness and number of charged plates. Starting batteries rely on a greater number of thinner plates to push the high energy burst required to power-up the boat’s engine. Their design also makes the products far more fragile and less able to sustain hard impacts. They are also more prone to degrading when used in a long-discharge fashion. For example, using a starting battery for trolling can shorten its life expectancy considerably. Along with engine starts, common uses include bilge pumps, navigation, courtesy lights, aerators, and general marine electronics among others. The common wisdom about battery choices tends to be to select either a deep cycle or starting battery. The basic ideas behind that are improved performance and lifespan. However, there are several suitable applications for dual purpose products. Because these units enjoy thick plates and a high level of antinomy that outpaces starting batteries, they have the ability to negotiate deep discharges without internal damage. When starting batteries are misapplied, their efficiency and life expectancy often suffer. The energy storage of dual purpose units generally falls below the ability of their deep cycle counterparts. The capacity does rank considerably higher than starting batteries. These attributes do not necessarily make dual purpose batteries a best-of-both worlds product. However, they can work in a good middle-ground fashion in certain instances. If your battery needs include the following, a dual-purpose unit may be suitable. Single battery runabouts and small fishing boats in which the battery handles engine starts and non-engine powered usage. When the battery is required to manage things such as general electrical needs and infrequent engine starts. Think sailboats. 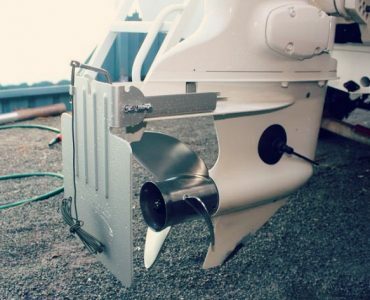 Boats that rely on a single battery to handle engine starts and general applications. In many ways, a dual-purpose battery is a lot like a hybrid car. The battery powers up energy needs when called upon but is not necessarily designed to run everything for long periods of time. For just a little more money, a dual purpose battery provides long-lasting service without having to purchase both a starting and deep cycle battery. The technical aspects of a given battery have a direct and discernable link to its effectiveness. It is important to consider how Lead Acid, AGM, Gel, or Lithium Ion cells could meet your needs. The first ever rechargeable product designed for commercial use, the lead acid battery was developed by France’s Gaston Plante in 1859. Considered reliable and a relatively inexpensive product in terms of cost-per-watt, it enjoys widespread popularity and use. Lead acid batteries dominate the field and can be found in most automobiles, warehouse machinery, golf carts and boats. Often referred to as “flooded batteries” in the marine sector, these units are constructed with a plastic outer casing that houses lead oxide plates with acid flooded between them. The interaction of these elements results in the creation of an electrical current. They are simple, common and effective. Lead acid batteries generally rank among the more cost-effective products to start engines, store energy and power devices off the grid. They can be designed to manage deep power discharges or high-energy bursts. This class of battery requires more maintenance than some other products and tends to be more fragile. The housing generally cannot withstand hard impacts and misuse can cause internal damage. Absorbed glass mat (AGM) batteries utilize thinly woven glass fiber separators to augment surface area and facilitate electrolyte wicking. The electrolyte-saturated fiberglass is designed to house the substance in a suspended or sometimes called “dry” state instead of it being free floating like many acid lead products. The battery functions by transferring the electrolyte substance from mat to battery plates, delivering a full charge. This class of battery is routinely used off-grid in systems such as solar, wind, robotics, hybrid and electric automobiles, as well as ATVs. They have been widely used in marine settings to crank engines in extremely low temperatures, as well as with trolling motors and electronics. AGM batteries do not use acid and therefore do not have exposed terminal corrosion. AGM products do not leak or suffer power loss if the casing is cracked due to a hard impact. These units consistently rank higher in cold crank amps and reserve capacity due to augmented plate surface. These products tend to charge more quickly and hold a charge longer than comparable acid lead batteries. Overcharging can result in life expectancy reductions. They generally function best when charged above 50 percent. Also referred to as a “gel cell,” this product utilizes a gelled type of electrolyte. Its sulfuric acid is blended with a form of fumed silica that renders the gel-like substance immobile. This design aspects makes them unique because they do not need to stand upright. The Gel class of batteries are praised for their high-performance abilities in marine settings. Industry insiders point to some models outperforming standard AGM products in deep cycle applications. Gel cells tend to be sturdy and forgiving. Hard impacts are generally not a serious problem and they can be placed on their side or upright. They consistently handle deep cycling better than some other comparable batteries. Users report significant issues aligning the correct marine battery charger with the gel cell product. These batteries tend to be finicky and the accompanying charger list can be quite specific. Also commonly referred to as “Li-ons,” this class of battery shuffles electrons from a pair of ends called the cathode and anode. The battery utilizes metal oxide, carbon and an electrolyte immersed in a salt solution with lithium ions. This class of batteries is used overwhelmingly in electronic devices such as cellular phones because of its welcome weight-to-energy ratio and storage capacity. Many Lithium Ions have not been designed specifically for marine use, but battery companies have begun releasing Li-ons for boaters. Professional anglers have embraced their use because they weigh far less than equivalent lead acid and AGM batteries. The pros carry 4-5 batteries, and going Lithium Ion can save them many pounds in weight, giving them an advantage over their competition. Li-ons are lighter by as much as 70 percent when compared to other products. They tend to have a greater life expectancy than equally sized batteries in their class. Lithium ion marine batteries are considered more environmentally friendly than other products. Lithium ion batteries are considered slower in terms of recharging. There have been hazards such as self-combustion reported. Marine-class units can be several times more expensive than other products. Selecting the best battery means matching your unique needs to a product that can effectively deliver. Consider this overview and don’t hesitate to speak with a marine battery professional if you have further questions. Group Size: This is simply an industry standard guideline for the physical case size of batteries. If your boat has a small compartment or built in battery tray, you may be limited to a Group Size that fits those dimensions. A larger number generally corresponds with larger reserve capacity, but not always. Measure the size of your battery compartment to narrow down your group size options to just 1 or 2 sizes. Reserve Capacity: Manufacturer calculate the reserve capacity by testing how long the unit can manage a load of approximately 25 amps before declining to about 10.5 volts at a given temperature. This equation generally applies to deep cycle batteries designed for repeated deep discharge, not necessarily starting batteries. CCA & MCA: Boaters that operate in cold climates are strongly advised to consider these measurements. CCAs or “cold crank amps,” refer to the level of amps a unit can push for 30 seconds at 0 degrees Fahrenheit. MCAs, or “marine cranking amps,” refers to the same standard at 32 degrees. Frigid temperatures can significantly impact battery function. Amp Hours: A battery’s longevity is generally measured by how long it can sustain a discharge above 10.5 volts in 80-degree weather. When tested, the models are recharged and run until dropping below 10.5 amps repeatedly until they falter. This method is used to determine a battery’s life expectancy. Regardless of what type of battery suits your needs, these recommendations can be universally applied. Be Consistent: Because each type of battery has specific charging needs, it’s in your best interest to stay with one type throughout your system. Although some newer digital chargers can set each bank to a specific battery type. Don’t Mix and Match: Replace a battery system in its entirety. Mixing old and new units tends to create a drag on the overall efficiency and shorten the newer ones’ life expectancy. Monitor Temperatures: It’s important to regulate your battery voltages in accordance with temperatures and charge acceptance. This can help improve battery life expectancy. The alternator should generally run 25-40 percent of the full battery bank capacity. Conditions Matter: Batteries function and last longer when kept cool, dry and clean. Maintenance Matters: Battery terminals should be regularly checks and only distilled water should be added to lead acid products. Batteries do well when they remain charged. Be sure to clear away any acid corrosion with a solution of baking soda and water. At the end of the day, marine batteries are purpose driven and the right product for one boater may not meet another’s needs. By selecting the proper group size for your electrical needs, and the right battery type and chemistry, you will make the most of the opportunity to maximize your rig’s performance for fishing success.